Harold Popp holds degrees from Ottawa University; Indiana University; and a Ph.D. from the University of Iowa. He has spent a lifetime involved in the world of the arts as educator, composer, conductor, trombonist, author, and editor. He is currently adjunct lecturer in music in general studies at the Indiana University Jacobs School of Music. As a professional trombonist, he has performed with the Kansas City Philharmonic, Opera and Ballet; South Dakota Symphony; New England Symphony and Brass Quintet and the Tallahassee Symphony. 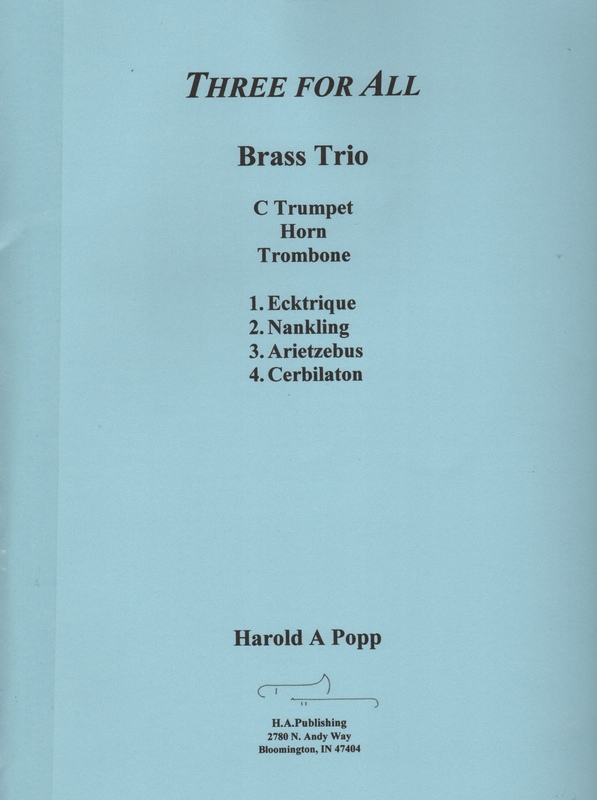 He has also recorded an album of his own chamber music for trombone: Pieces from the Wood Box. Three for All was commissioned by the Pegasus Brass Trio and premiered at Wichita State University in 2009. It explores a variety of timbres, rhythms, and musical ideas. The titles of the four movements, Ecktrique, Nankling, Arietzebus, Cerbiliton, are not actual words. They were fabricated but do have a particular attachment to the music of each movement. The first movement contains contrasts in tempo, technical demands, energy, and dynamics. The slow, lyrical and legato second movement offers the most extensive possibilities for musical expression. Movement three is a quick and light polyrhythmic perpetual motion. The final movement presents changing and irregular meters with each instrument having solo opportunities. Unique to this movement are the percussion parts played at various times by each performer. The percussion instruments are not designated, thereby allowing the performers to explore the timbres they prefer and consider most comfortable. This is well-crafted music in an accessible, conservative, contemporary musical language. It is within the technical and musical capabilities of mature college level performers.